A busy January meant 2019 got off to a strong start for Rainbow Productions. 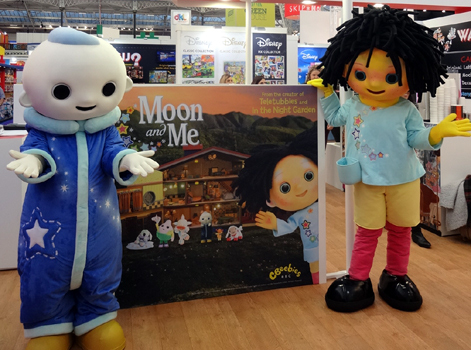 The London Toy Fair was a particular highlight with 19 characters walking the aisles at Olympia London, including new additions Pepi Nana and Moon Baby from new pre-school show Moon & Me, which airs on CBeebies from today. 9th February: Peppa Pig will be at Duke of York Square in London to help celebrate Chinese New Year and the Year of the Pig! 14th February: Peppa Pig and George are booked to appear at the Mercat Centre in Kirkcaldy. 16th February: The Gruffalo will be appearing at Dreamland Margate. 16th February: PAW Patrol duo Chase and Marshall will be at Smyths in Thanet to see fans. 16th February: Also visiting Smyths in Thanet are everyone’s favourite night-time superheroes, the PJ Masks. 16th & 17th February: Visit Affinity Lancashire to see Peppa Pig during Story Time Sessions, led by a narrator. 17th February: Catch the cheese-loving duo, Wallace & Gromit, at Cheesefest at the Bowlers Exhibition Centre in Stretford. 19th February: Ice Age’s Sid will be appearing at Drake Circus in Plymouth. 19th February: Shoppers at Intu Merry Hill might be lucky enough to spot Paddington. 19th to 21st February: Great Central Railway in Loughborough will be hosting Chase and Marshall. 20th February: Peppa Pig and George will be at St Marks Shopping Centre in Lincoln. 20th February: The ever-popular Catboy and Owlette will be at Old George Mall in Salisbury. 21st & 22nd February: Mr. Strong will be appearing at Under 1 Roof in Woolwich as part of their ‘Mr Chef’ interactive cookery event. 23rd February: Meet Dora the Explorer at The Square Camberley.